Lock in a great price for Parador de Cuenca – rated 8.8 by recent guests! The hotel is in a old monastery, which has maintained its beauty. And it sits across a ravine (cross-able by a walking bridge) from the old town of Cuenca, a walled city with 'hanging houses.' 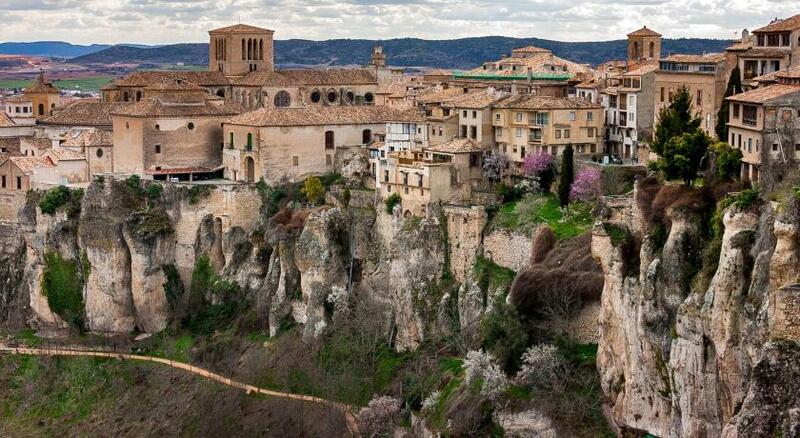 The views are stunning, and you have easy access to the best Cuenca offers. I wouldn't stay anywhere else! This parador was very special -- and had little areas throughout that were inviting to sit in. It is well-maintained. We upgraded once we arrived for a view of the city and hanging houses and were glad we did. It is an easy walk across the bridge to get to town. EXCELLENT BREAKFAST, DELICIOUS FRUITS, GREAT VARIETY OF CHEESE AND HAM, PASTRIES AND BREAD! BEDROOM WAS VERY COMFY, AND THE STAFF IS VERY ATTENTIVE AND FRIENDLY. WE ARRIVED VERY LATE IN THE NIGHT BUT THEY MANAGED TO ORDER A ROOM SERVICE TO FEED THE HUNGRY LATE NIGHT PASSENGERS! THKS!!! The beauty of the retained architectural details! Attentive wait staff in restaurant. Desk staff were very very helpful. I mislaid my bag and the museum staff made sure to let the desk staff know, then they relayed the message. Fantastic location, very large building with a large courtyard, very tranquil feel to the place. Very comfortable room and bed. We had a great meal in the restaurant. 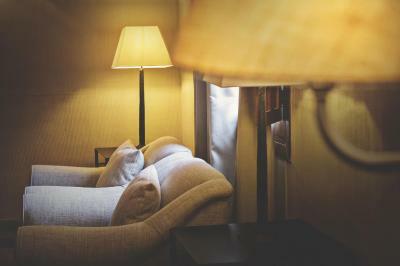 Everything you'd expect from a Parador - luxury and history. The view from this Parador was exceptional. 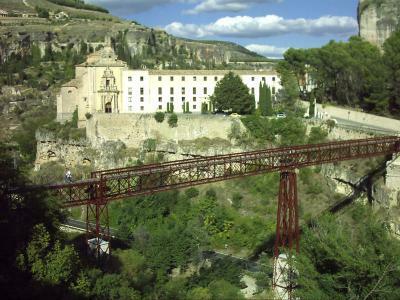 The gorge of Cuenca with suspension bridge and 'hanging' houses. 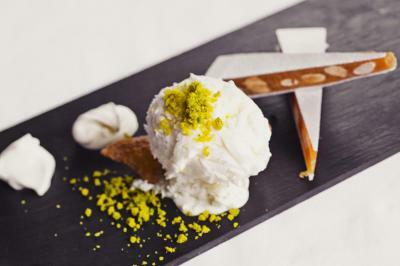 Everything beautifully presented from breakfast to dinner and everything in-between. We stayed only for one night, we took a room with a view and it was worth it. The location is perfect. You just have to cross the bridge and you are in the beautiful city of Cuenca. The Parador is beautiful, location is great, food is excellent, views. Parking is difficult because it is a medieval city. We found parking on the street, and didn't move the car until we left. Nice pool! Parador de Cuenca This rating is a reflection of how the property compares to the industry standard when it comes to price, facilities and services available. It's based on a self-evaluation by the property. Use this rating to help choose your stay! 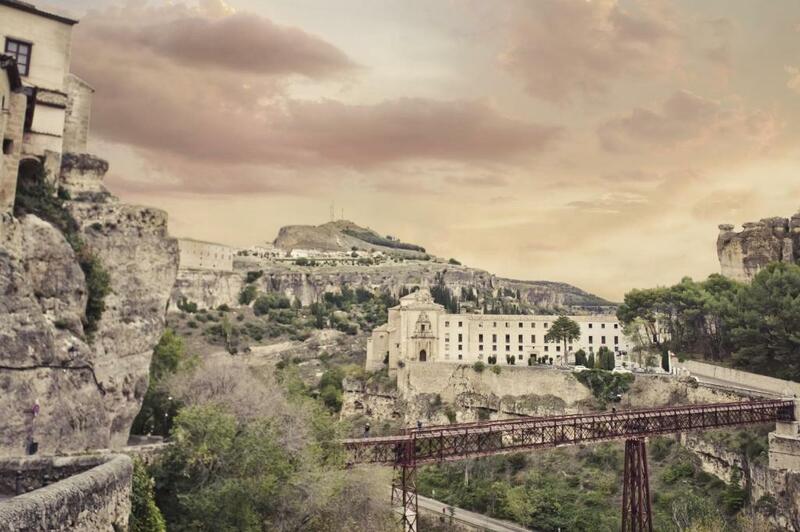 One of our top picks in Cuenca.Spend a short and relaxing break in the luxurious Parador de Cuenca, with excellent views of the famous hanging houses, set across from the hotel. Housed in a former convent, this hotel has conserved its original architectural features. The interior patio area is ideal for keeping cool in the afternoon heat, and enjoying a read. Combining the original charm, with contemporary touches, this hotel is stylish and comfortable accommodations for a stay in historic Cuenca. Take a dip in the Parador’s outdoor swimming pool in the hot weather, or get more active in the on-site gym. There is also a sauna where you can unwind after some exercise. Dine in style with all the family in the Parador de Cuenca’s on-site restaurant, where you can sample traditional-style Cuencan cuisine. This property also has one of the top-rated locations in Cuenca! Guests are happier about it compared to other properties in the area. When would you like to stay at Parador de Cuenca? This charming room features satellite TV, a minibar and a private bathroom. This twin/double room features a satellite TV, mini-bar and air conditioning. Gift voucher of THB 500 is offered. This air-conditioned room includes 1 double bed and a mini-bar. This room features a twin beds, en-suite marble bathroom, flat screen TV, free WiFi, mini-bar, tea and coffee making facilities, air conditioning, desk and laptop safe. The hotel is in a former monastery with an enviable location atop the Huécar Gorge, site of sheer walls and dense vegetation in the outskirts of the city, opposite the magical Hanging Houses. You will be charmed by the glass-enclosed cloister and the former chapel, now a cozy café, our seasonal swimming pool and the lovely panoramic views of the city you will enjoy from our comfortable guest rooms. 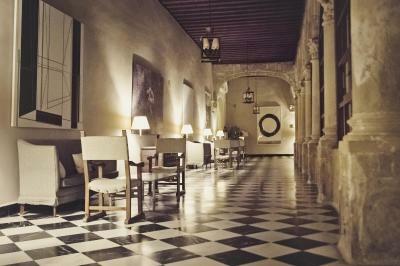 House Rules Parador de Cuenca takes special requests – add in the next step! Parador de Cuenca accepts these cards and reserves the right to temporarily hold an amount prior to arrival. Please note that due to a private event on 14 July, 2018, the swimming pool will close at 17:00. Very hard beds. Staff were professional but not really very friendly and no advice about the local area was offered. I'm not sure if this is a standard Parador way of doing things - very formal and stiff at times. It wasn't the weather for trying the swimming pool but it is a short walk across the car park and beyond the tennis court. This would have put us off using it if it had been nicer weather. This was our first time staying in a Parador and overall it was a good experience despite its quirks. Beautiful location, great view from our room, the building is stunning and well-maintained. Breakfast was varied and good quality. The hotel started serving breakfast at 8 a.m. which was a bit late for us. The breakfast included local delicacies, fresh orange juice, a good assortment of cheeses, pastries, truly varied. The location of the hotel couldn't be better offering great views of Cuenca. The staff went out of their way to ensure you were well taken care of! The property is gorgeous and the restaurant served us delicious meals, be it breakfast or dinner. Amazing property, great location, friendly staff, very clean and beautiful room! They could improve on the check in and the breakfast. The hot food and coffee was cold even though sitting on warmers. I was given a 15% off meals voucher as I was checking out. No use to me then, so wasn't encouraged to try the restaurant. Lovely room and views to the bridge and old town. Easy access to the old town via the San Pablo footbridge. The restaurants in town were wonderful. Comfortable bed. We can't think of anything we didn't like. We enjoyed the breakfast selection with a variety of choices for a hearty and healthy options. Coffee and tea were served individually which was a treat. The pastry sweets were delicious and service was excellent. A fabulous Paradore, it blew us away! The views are second to none and walking over the foot bridge we found the fabulous square where we had a drink in the sun. An excellent welcome too. Our bed at home is more comfy and we would have liked tea making facilities in the room. The staff were excellent and went above and beyond their normal duties to make us comfortable and happy. Super staff at a super place. We wish we could have stayed longer.